People spend more than 90% of their life in closed and ever more airtight interior spaces. The climate and air quality here is dictated ever more exclusively by construction physics and building systems. The knowledge and capacity to control the temperature according to set targets is available; we have the freedom to choose. This freedom of choice is not shared by the respiratory tract, skin, and eyes, nor by the building’s occupiers. With no ifs or buts, the respiratory tract must capture every drop of humidity which is not supplied by climate control technology. From every position, it has to process inhaled air in such a way that the alveoli receive one hundred percent moisture. The nose, mouth, throat, and bronchi have to compete with the merciless, thirsty air which strives for saturation, i.e. 100% moisture. It picks up humidity wherever it is available, whatever its form. For large amounts of time, as they are the only source of humidity in working environments and in residential areas, humans become their own air humidifiers. We should realize that the humidity supplied by these ‘human air humidifiers’ fairly rapidly reaches a threshold when complaints and illnesses begin to occur. So what does it actually mean if the humidity in a large building does not exceed 20 or 30%? It means that the demands on the nose, throat, and bronchi of everyone present may lead to potential decompensation. The drier the air, the more dust it contains. During the heating season, dust and dryness strain the ability of the respiratory tract to its limits and beyond when it regulates the temperature and keeps the airways clean. This creates a double load where the two constituents reinforce each other. 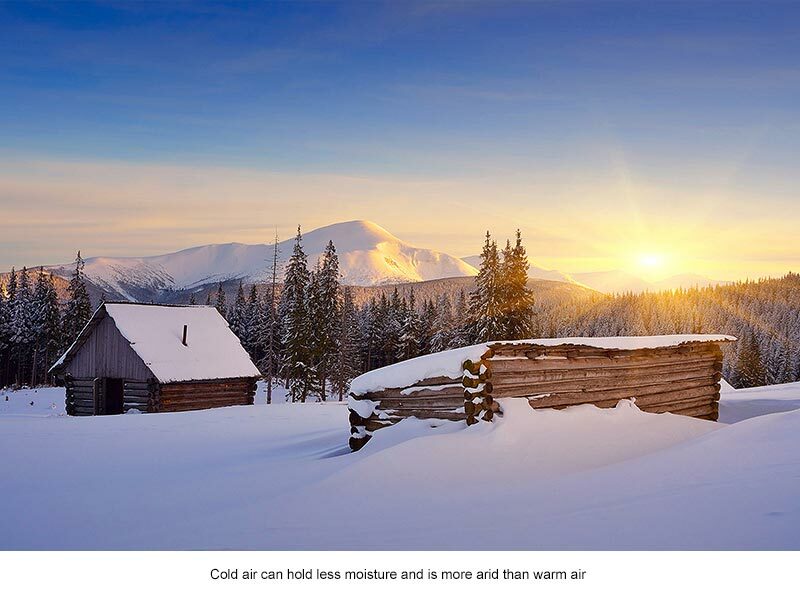 Our indoor climate presents a challenge to our respiratory tract which it never confronts outside. In all independent surveys over many decades, 30-40% of building occupants have said the same thing—that ‘the air is too dry.’ Should their request for better humidification be seen as a demand for comfort? The answer by an informed and concerned doctor is clear: no! There are no sound arguments supporting a humidity of below 40% in terms of appropriateness or even advantages — but there are numerous, documented disadvantages to health. The majority of people don’t really notice the level of humidity in the air, or there is a delay before they do so. Thus, the manifold consequences to health of those affected can only be loosely associated with the level of humidity in the air. 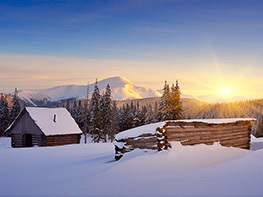 In fact, the devastating consequences of dry winter air have been seen by the vast majority for years as unavoidable and natural, have not been associated with a causal connection, and have been tolerated. Year after year, during the heating season, most of us will at least catch a cold. We are regularly affected by flu epidemics, and chronic respiratory tract infections (nasal allergies, asthma, chronic obstructive pulmonary disease (COPD), sinus problems) worsen and increase. We hardly question this — but this is wrong, and a detriment to our health. We can only survive huge fluctuations in dampness and temperatures outside unscathed because we all carry around our own, efficient climate control unit: our nose. Its task is to clean the air and regulate its temperature (humidifying and heating). It is always being claimed that our nose can cope with the demands of the dry and dusty winter air. This is, in fact, true for those of us whose noses function perfectly and at an optimum level — about two thirds of the population. Abnormally-shaped noses and, primarily, blocked noses with increased flow resistance cannot supply an optimum temperature, as a complete or partial conversion to breathing through the mouth has to be made. A feeling of congestion and nasal dryness are the two most common nasal complaints and don’t just affect allergy sufferers (rhinitis and asthma, 20–40% of the population). Those with previous damage to the nasal mucosa (for example, due to recurring infections), smokers, and many senior citizens are also affected. Dry, hot air means additional stress for all of these groups, which they cannot avoid at their workplaces or even in public buildings and shopping centers. The mucosa in their respiratory tract is damaged and is more susceptible to infection. As allergies have been increasing constantly over the past fifty years and our interior spaces have become drier and drier, this issue is becoming more and more important. ‘How and when is humidification actually useful and when is it indispensable?’ the editors of cci Zeitung asked in the March 2015 edition, which was published before ISH/Aircontec in March. The editors presented two new studies on humidification which came to differing conclusions. Discussions regarding these studies were sparked by ISH and are still continuing. To recap: Alongside a current Fraunhofer study which underlines the benefits of humidification, an analysis by Kurt Hildebrand, Professor of Building Technology at the University of Lucerne, Department of Engineering and Architecture, addressed the question of whether it was useful just to increase comfort by humidifying the air in internal spaces. In cci Zeitung’s July 2015 issue, the cci Zeitung editors published extensive reader reactions to this controversy. Another specialist also had his say in this edition: Dr. Walter Hugentobler, who spoke about air humidification from a physician’s point of view. In the next issue, there was an expert contribution from Professor Emeritus Klaus Fitzner, who put forward the argument from a technical sciences viewpoint. What sort of indoor climate should we be aiming for during the heating season? The low humidity settings are often justified with the comment that, in our climate, similar values occur outside. This way, they cannot be classed as unnaturally low. A comparison of hourly averages (air humidity of 20 to 24°C, i.e. at indoor temperatures) in our moderate climate reveals that only a small percentage of the hourly average falls below 30%. The median value of air humidity is consistently over 50%, even in dry regions and areas with dry winds (Föhn). Therefore, the amount of humidity indoors during winter is clearly below that of our moderate climate. Should the maximum release of humidity from the human body which affects many bodily systems not be supported, or only be accompanied by ‘comfort-related side effects’? Demands are placed not only on the respiratory tract, but also on the eyes, skin, brain, kidneys, and blood. Changes due to dehydration are detectable and measurable in all the organs mentioned, without exception. 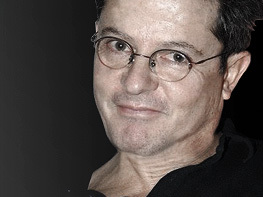 The best known, examined, and reliably reproducible effects are those on the eyes and skin. Its negative effects on brain performance are also well documented. So, for example, the literature on the subject of flying (aviation) is full of papers on the dangerous consequences of dehydration on pilots’ vision, their level of responsiveness, and their decision-making processes. The negative effects of dry air on the intellectual performance of office workers and students have also been frequently documented. Air quality is defined by the quality and quantity of particles and humidity content. The water content of air is, in this context, the main physical parameter. It has a direct effect on nearly all processes relating to particles. These take place in a microscopic world which is invisible to us. However, their daily effects are known by everyone and are readily understood. The colloquial phrase ‘dry as dust’ sums up the most important physical effect of dryness. Dryness is associated with high dust levels in the air. In relation to a surface, this phrase means that it has dried out so much that no dust can stick to it. 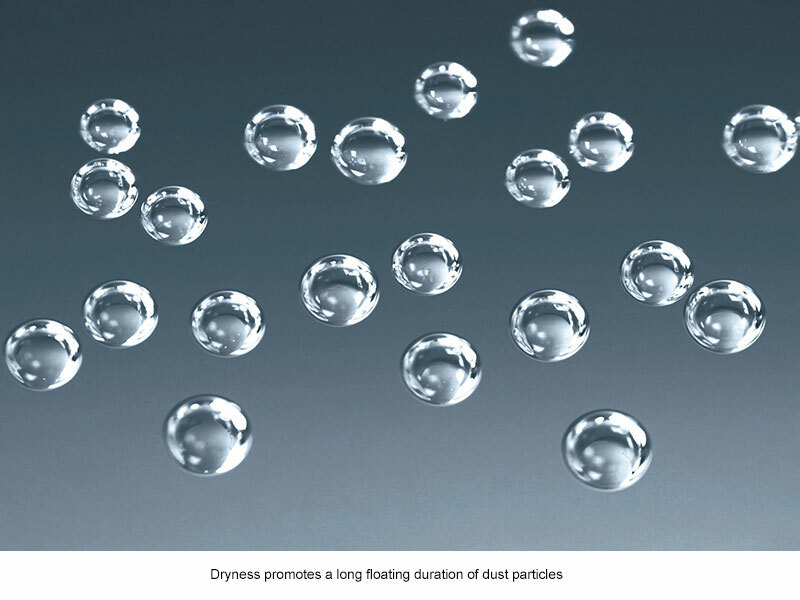 Basically, dryness demands a greater ‘float time’ for dust particles, and if these land on a surface they will not cling to it for any length of time. Both of these strain our respiratory tract. 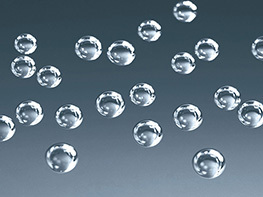 From a physical perspective, the air we breathe is a mixture of gases, solid and droplet-shaped particles, and moisture. This mixture is called an aerosol. From a health point of view, most particles are air contaminants and many pose a serious risk to our health. Occupants of a building have no choice: they must breathe in whatever is provided. The aerosol mixture is invisible to the naked eye, although even fresh, clean sea air contains about a thousand million particles per cubic meter. The fine and coarse dust and droplet-shaped aerosols float about for hours in the air, depending on their size, and are whirled around by thermal and forced convection currents, divided, thinned out, and transported outside. In a given room, most dust does not float about in the air but is deposited on surfaces. The dynamic distribution of particles between surfaces and the air is significantly affected by humidity and convection. What is the significance of humidity in this dynamic interplay of forces? Humidity supports the processes which remove dust from the air and make it adhere to surfaces (reduction in dust disturbance). All of these processes can be examined and quantified in experiments. They also reflect our daily experience. If we want to clean dusty surfaces, we spray them with water or at least wipe the dust off with a damp cloth. Otherwise, the whirling dust gets into our nose and airways and causes sneezing and coughing. The soothing effects of increased air humidity are well known to all those who are allergic to pollen. Higher air humidity keeps pollen attached to flower heads and surfaces and prevents their passage into the air. Therefore, humidity allows those who are allergic to pollen to breathe easy, even in closed rooms. People who are allergic to animals and mites (‘dust allergies’) benefit in the same way. Higher humidity makes house dust (carriers of the allergens mentioned) stick to surfaces, and the concentration of allergens in the air decreases. The air feels fresher and more pleasant. We are fully in our thermal comfort zone and not in a transitional zone which, depending on your point of view, could be described as ‘still comfortable’ or ‘getting a little uncomfortable’. The perceived temperature is 1 to 2 degrees higher, which means that comfort can be achieved by setting the room temperature 1 to 2 degrees lower. Internal heat recovery is better with higher humidity. A person’s heat output changes from latent to sensitive. Fewer unwanted electromagnetic currents are formed. Less water evaporates onto valuable furniture, paintings, musical instruments, textiles, and books. This means that they retain their value over a longer period of time. Flu viruses and cold viruses that make us suffer over winter are largely killed off within a matter of minutes. The above advantages are dispensed with at home and work with comments such as ‘too expensive and energy-intensive’ or ‘the risk of mold is too high.’ In the manufacturing sector however, these advantages are widely used to optimize processes and also to reduce dust and noise. Humidity is indispensable anywhere where unwanted dust due to drilling, grinding, and milling has to be reduced, even in the treatment of poisonous industrial fumes. In some respects, experience gained in clean room technology can be seen as the standard for achieving targets in the building services industry. The basic idea of clean rooms is to achieve the least possible amount of airborne particles. In most clean rooms, this is achieved with humidity of 50 to 60% and specially-designed displacement ventilation. Special dry clean rooms are used in the chemical and pharmaceutical industries where very low humidity of only a few percent may be needed for certain processes. In these rooms, a face mask must usually be worn. This serves as protection from dust exposure and reduces drying of the airways. Special anti-static skin-protection suits, and frequently gloves, are also worn. These workplaces have special rules in place to regulate breaks, drinking patterns, and skin care. These workplaces are perfect for illustrating the fact that dryness is not harmless. When people are not present and active in a closed room, a type of ‘background concentration’ of particles can be measured. It is affected by the quality of the outside air and supply air from any filters present. The worst contamination by harmful dust (‘house dust’) occurs when users of the internal space are active. This cannot be influenced by the supply air filters. Various tasks and unavoidable actions, such as walking about, opening and closing doors, cleaning, and handiwork can increase the number of particles tenfold or up to a hundredfold. A higher rate of humidity in the air has a preventative effect: it keeps some of the unwanted particles stuck to the surfaces where they can be disinfected, absorbed, and disposed of. The events described have daily and very practical consequences for our workplaces and living spaces, but also for medical and scientific manufacturing processes. The advantages of well-humidified air are utilized specifically in these applications, and willfully neglected in living spaces. Air humidification offers a largely hitherto unused preventive potential. We should make the most of it.